Mary Ansell (1862-1950), Actress; wife of Sir James Matthew ('J.M.') Barrie, Bt. Sitter in 2 portraits. Isabel Maude Penrice ('Belle') Le-Poer-Trench (née Bilton), Countess of Clancarty (1867-1906), Music hall entertainer; wife of 5th Earl of Clancarty; daughter of John George Bilton. Sitter in 34 portraits. 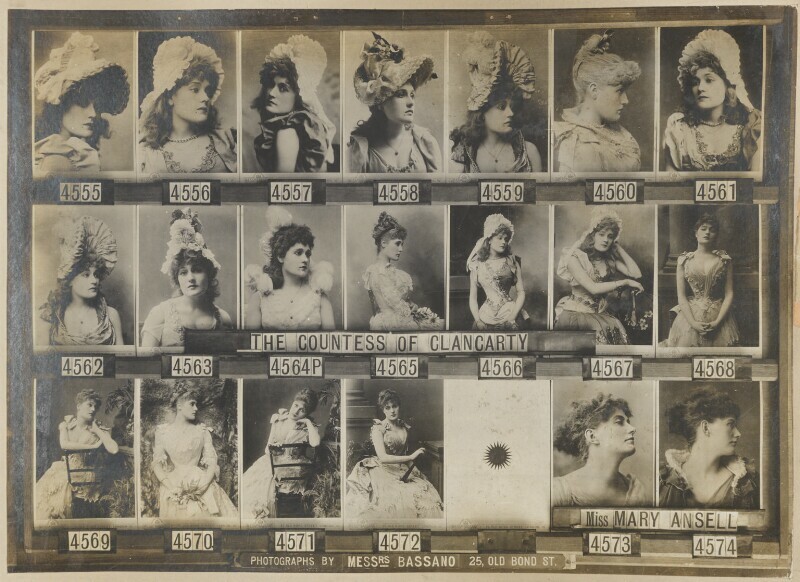 This page from an album marked 'The Property of Alexander Bassano' depicts a number of cabinet cards, showing varying poses, lined up on a wooden frame, along with the sitters' names and sitting numbers, which have then been re-photographed. The sitters in the album are society beauties, popular figures and actresses, such as Belle Bilton (Countess of Clancarty) and Mary Ansell who are pictured here. It is possible that Bassano used this album as a catalogue for the ordering of prints.